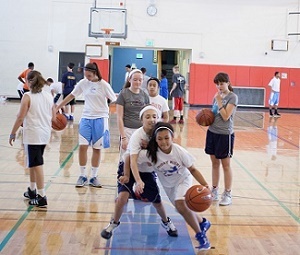 Insurance While the Basketball/Life Skills camp carries liability insurance, all campers are required to provide their own medical insurance coverage. Coaching High School coaches and current and former high school and college players will provide coaching by exposing campers to the fundamental skills of the game through proven coaching methods. Our camp does not guarantee success as a player, but it will expose campers to the ingredients necessary to becoming a skilled player and successful high school student-athlete. Life Skills Classroom sessions are taught by our camp directors and the curriculum is carefully designed to teach campers how to enhance the social experience that youth should receive from playing sports. Daily sessions are centered around developing social skills, teamwork, and also include academic success strategies, along with developing important life-long values such as hard-work, integrity, self-discipline, and other important life lessons.